No matter where you’re from, receiving a rose will be interpreted as a loving gesture. And the extent of which can arguably be measured by the number of roses presented. Do two roses mean twice the love of one rose or a dozen roses say “I love you”, so where do you stop? More importantly, it is the symbolism in the feelings that you want to convey to your loved one. If you are going on a Valentine’s Day dinner, roses are inextricably part of the occasion. You don’t want to be giving any odd number of roses for no reason, especially if you are going for anything other than one or a dozen roses. What you want to display is a clear and strong intent. Now, before you even want to go into all the logistics of finding the best restaurants for Valentine’s Day 2018 and selecting a lovely Valentine’s Day set menu, you ought to figure the gifts side of things first. 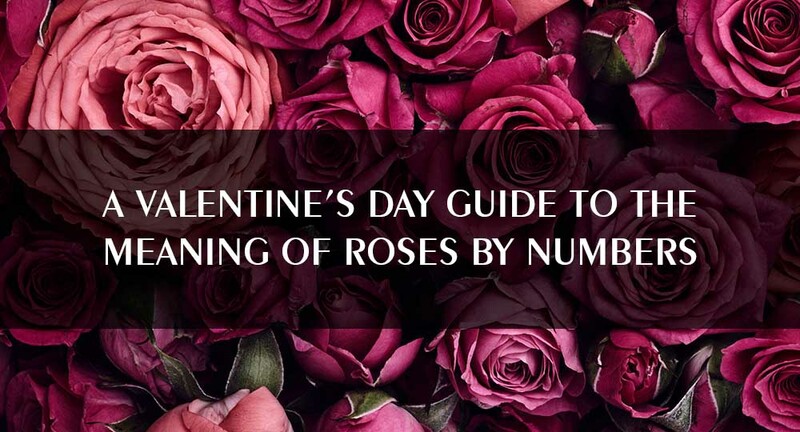 To help you to complete what you choose from all the Valentine’s Day events in 2018, we’ve put together our knowledge of the meaning of the number of roses in the following guide to help provide a romance yardstick as to how you would like to declare your love! You and I make a pair. Two is the number of interdependence and balance between a duality. Very simply, ‘I love you’. Thrice the charm, they say – the completion. Speaks of foundation. The perfect way to make a promise to say ‘nothing will come between us’. As the number of grace, five roses are a great way to show your love for that special someone. To show how much you care for a friend or partner, five roses perfect. Signifies ‘I want to be yours’; or the completion of the beginning. If you’re dating someone and wish to take your relationship to the next level, gifting them with six roses is a perfect way express those feelings subtly. Seven is sacred. There’s something divine about sevenfold. It is telling her you will love her for every single day of the week. Affection, care, and support; it is the number of plenty and new beginnings; especially good when someone is going through a tough time. A symbol of eternal love. You would often give this exact number of roses to those you wish to spend the rest of life with. In Chinese, nine is a homonym of long-lasting. Completeness; a simple yet powerful way to tell a special someone ‘they’re perfect’. ‘you are my treasured one’, or that ‘I’m incomplete without you’. The meaning of roses when presented in the number 13 can either symbolize eternal friendship or a secret admirer. The completion of an epoch, especially one of two phases. Fourteen roses help you to say that ‘we did it’! If you’ve done something to upset someone and wish for forgiveness, opt for 15 roses. Say ‘Bon Voyage’ with 16 roses. This is the number of roses you would gift your wife, be it on her birthday or another special occasion. The number of youth and beauty, that your love will stay as passionate as it is in time to come. The number of roses to give someone you plan to wait for. symbolic of sincerity and belief. this quantity boasts two meanings – togetherness and wish you the very best of luck. For the ruby anniversary. And to show that you are willing to go through or have gone through the lows in life with them. When you wish to pledge an unchanging and constant love. This number in a bouquet simply means ‘love’. This quantity on the other hand suggests ‘my love for you will never change’. For the diamond and gold anniversary. This number of roses signifies ‘faith’ and that you believe the person you are gifting is your soul mate. If you owe someone a rather big apology, 88 is the number of stems to choose. You are the only one for me, and I’ll love you till death do us part. Roses – I am utterly devoted to you for eternity! All you need now is the perfect platform to present your Rose bouquet, and there’s no better romantic venue than Luxury Tall Ship Royal Albatross – a 47m Superyacht that has fast emerged as Singapore’s premier and only venue for a romantic Sunset Sail dinner cruise. Among the things to do on Valentine’s Day in Singapore this 2018, Royal Albatross’ very own Valentine’s Day dinner, packed with experience and entertainment, is held on the largest sailing yacht in the region. Royal Albatross makes a candlelight dinner under the stars while cruising along Singapore’s city skyline a new possibility, but don’t forget to order the Roses this Valentine’s of course!